Nope, no relation to the Oliva Serie V, which, by the way, is an awesome cigar. Very awesome. Loads of flavor with a decent amount of strength…. But this review isn’t about that Oliva cigar, or any Oliva cigar for that matter, it’s about a La Flor Dominicana cigar: the Limitado V.
This cigar is a bit larger than I normally smoke, which is a tidbit that doesn’t necessarily have any significance to it. The chocolatey brown wrapper is undeniably rustic looking with a maze of veins all over the place and the wrapper is very oily to the touch. I’ve smoked a few of these so far and I’m going to review it now so let’s get it started. There’s a bit of sweetness that comes on during the second third but it’s definitely a background flavor; it’s nice. The earth and chocolate slowly dissipates during this third and is replaced by notes of oak and toast. Maybe not as good as the first third but still very good. The final third is much the same as the second third but with more toast thrown in the mix. Maybe not as good as the second third but still very good. Don’t read too much into those “not as good” phrases. Medium-full bodied with a good draw and burn; it’s an excellent cigar. There are a ton of flavors that all work well together and build off of each other. What really surprised me about this cigar is its absence of spice, which is something that I usually get in a cigar and something that I like. It’s absence was not noticed by me until near the end of the cigar, which says something good about the flavors present. 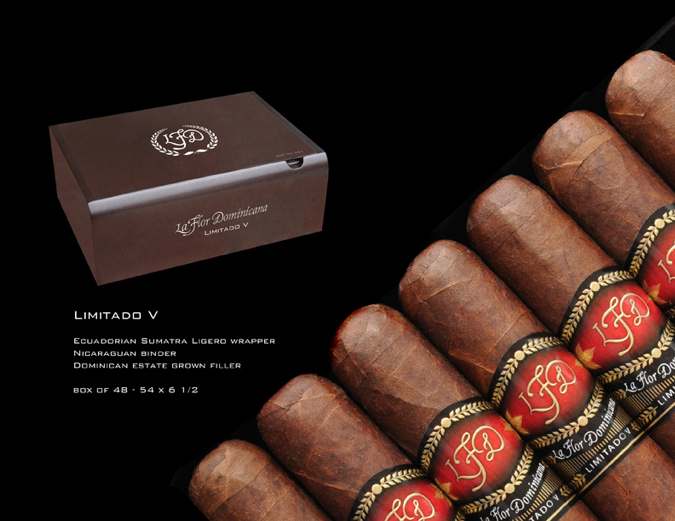 The Limitado V is a very good addition to the La Flor Dominicana line of cigars.